This is a great hotel if you are looking for a place to stay in the Brisbane CBD, as it's located right on the Queen Street Mall, so you couldn't get more central. I had a two-night stay here recently and found it great value for money, really comfortable and just in the best location and with great facilities. My double room (at $119 per night, max 2 people) was large, clean and spacious with a desk, TV, dining table and chairs, tea and coffee making facilities, fridge and freezer, en-suite bathroom, hairdryer and free toiletries. They have a variety of rooms available including Deluxe Rooms, Executive Suites, Courtyard Rooms and Luxury Spa Rooms. They have a cute outdoor rooftop pool, with free towels, tables and chairs, sun beds and spa hot tub. It is very satisfying to be lying in the sun and having a swim in the pool, looking down of over the hustle and bustle of the city below. Just a few minutes walk away you have the Brisbane Convention and Exhibition Centre, South Bank Parklands, the Queensland Art Gallery, Casino and the Brisbane Botanic Gardens. Plus you have all the usual things that the vibrant CBD has to offer, such as a diverse mix of bars, cafes, restaurants and shopping literally on the doorstep. I loved that I could come out of the hotel and be on Queen Street and just five minutes walk from South Bank. But, if you don't want to leave the hotel for a night they do have a cocktail bar and restaurant in the lobby, which has live entertainment most Thursday and Friday evenings. The restaurant offers breakfast, lunch and dinner and evening snacks. They offer valet car parking ($30 per day/night), WIFI (pay per usage) and room service options and your choice of complementary newspaper in the morning. 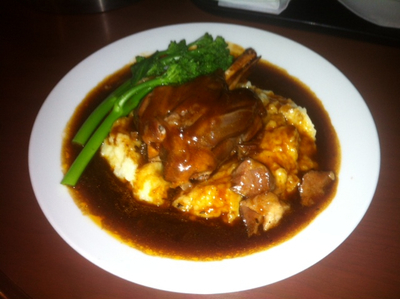 I ordered room service one night, I had the Braised Lamb and Mash and it was lovely. They also have beauty treatments, massage and spa facilities available. The staff are really friendly and pleasant, sometimes I find, especially in city hotels, they can be slightly cold, but everyone I spoke to were really helpful and chatty. The nearest station is Central Station, which is just a few minutes walk away, and offers direct links to the airport and the Gold Coast. Check in is from 1pm and check out is by 10:30am, but the reception is 24-hour. For such a central location I found it very reasonable, as I have paid almost the same for a room outside of the city, so I shall definitely be staying here again in the future. Thank you very much for taking the time to post your comments. Your feedback is very much appreciated. I was so pleased to read that you had an enjoyable stay and the location of the hotel and would choose to stay with us again. I have passed your feedback on to our staff and they were delighted that they had helped make your stay enjoyable. I hope you will return to the Chifley at Lennons again soon. Again thank you for your review. Looks like a really nice place to stay at. The pool looks really re-refreshing.